Remembering our Bloggin Friend Michael Higby on what would of been his 53rd Birthday. Mayor Sam Exclusive: 51st AD Candidate David Vela Paying AB-109 Parolees To Phone Bank? In a Mayor Sam Exclusive, we disclose that the David Vela Campaign is allegedly using "AB-109 Low Level, Non-Violent Paroles (associated with Victory Outreach)", as phone bankers, rising serious questions whether confidential voter information is being disclose to convicted felons. 51st Assembly District Candidate David Vela. 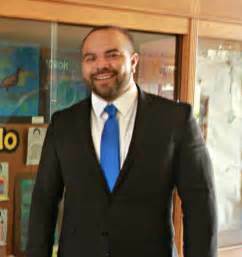 ** Blogger's Notes: The Mayor Sam Blog has learned from a VERY RELIABLE Source that the 51st Assembly Campaign of former Montebello Unified School Board Member David Vela, is allegedly using "AB-109 Low Level-Non Violent Paroles (associated with a Victory Outreach Ministry)", to phone bank voters before next Tuesday's Special Election. According to the Source, a registered voter received a Phone Call from the David Vela Campaign, that inquired whether the voter would be incline to support the former Montebello School Board Member. The voter responded by asking about Candidate Vela's position on AB-109 Prison Realignment, which played a major role in the recent death of Whittier Police Officer Keith Boyer ....., and was SHOCKED to learn that the Campaign Phone Banker was a recent AB-109 Low Level, Non Violent Parolee associated with a Victory Outreach Ministry. If verified, the use of Convicted Felons, errrrr, "AB-109, Low Level, Non Revocable Violent Paroles" as Phone Bankers, raises serious concerns regarding the access of confidential voter (included members of Law Enforcement) information by those with a criminal record. That stated, the fact that the Vela Campaign is allegedly using Victory Outreach-associated Paroles as Phone Bankers, is NOT SURPRISING, when noting Candidate Vela past (and present) association with dubious characters of Southeast LA County Politics. Video of Illegal Campaigning by Victory Outreach in recent Commerce City Council Elections. After the first 51st AD Candidate Forum at Eagle Rock High School, a Longtime Political Observer in handicapping the aspirants seeking to replace, NOW Congressman Jimmy Gomez, noted that Candidate Vela was being supported by Gil Cedillo Jr. (who's Dad endorsed the Vela Campaign) ......, and the INFAMOUS Mario Beltran (who is currently the alleged Puppet Master of the Huntington Park City Council). In recent days, sources tell Mayor Sam that controversial Montebello School Board Member Hector Chacon (and his Political Family), is also helping with the Vela Campaign, which would provide the link to Victory Outreach, via equally-controversial brother Central Basin Water District Director Art Chacon. From the Los Angeles Times in 2012 ........., the Chacons have also relied at times on Victory Outreach, a church that ministers to former gang members. The family uses church volunteers as ground troops to answer phones, pass out campaign literature and help with get-out-the-vote efforts. Family committees have paid more than $10,000 in campaign funds to the church since 2003, records show. 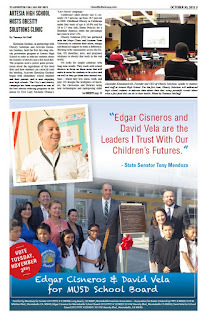 2015 Los Cerritos News Ad for David Vela and Edgar Cisneros Montebello Unified School Board Campaign. More recent, the LA Weekly in an expansive EXCLUSIVE on the Hews Media Group (and its Publisher/Editor Brian Hew's CLOSE relationship with Hector Chacon) disclosed that Montebello Unified School District (under the, THEN leadership of Vela, Chacon and endorser Edgar Cisneros), approved $27,000 in ad buys for the Hews Media Group ............, which ENDORSED Vela in his unsuccessful, Re-election Campaign in 2015-----Scott Johnson. A Bloggin Clear Cutting of a RL Miller Facebook SPIN Posting regarding 51st AD Candidate Wendy Carrillo's "Funding Pipeline of Hypocrisy (with funding from Big Timber)"
We engage in a thematic, Clear Cutting Deconstruction of "Climate Hawks Vote" Co-owner R.L. Miller's Facebook Post (ie. 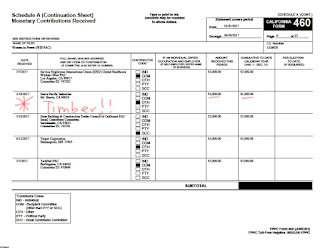 myopic Spin), regarding the ALLEGED smearing of 51st Assembly District (AD) Candidate Wendy Carrillo, via the FACTS of Big Oil, Energy ........, and TIMBER's funding of her Campaign-supporting "Women in Power (WIP) PAC". 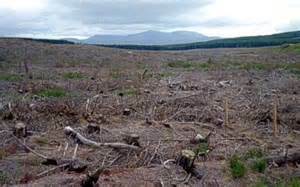 WATER IS SACRED ........, before Wendy's BIG TIMBER contributors clear cut its cleansing watershed. ** Blogger's Notes: With NO apologies to a certain "R.L. Little" of the Climate Hawks Vote Super PAC, we engage in a thematic, Clear Cutting Deconstruction of her Facebook Post/SPIN to our alleged, bloggin smearing of 51st AD Candidate Wendy Carrillo yesterday (Wednesday). For the record, we have cut and pasted Little's comments in whole ........., and we (BOLD) our responses to her keyboard utterances-----Scott Johnson. I want to talk about smearing (spin speak for outing inconvenient facts) of a candidate. I've been contacted by multiple people, both pro and con, regarding Wendy Carrillo, candidate for 51st Assembly District, and whether she's taken money from Chevron or not. I dug into the claims behind a particular blog post, and found some facts. A Clear Cutting Deconstruction through the Spin Forest. TIMBER!! 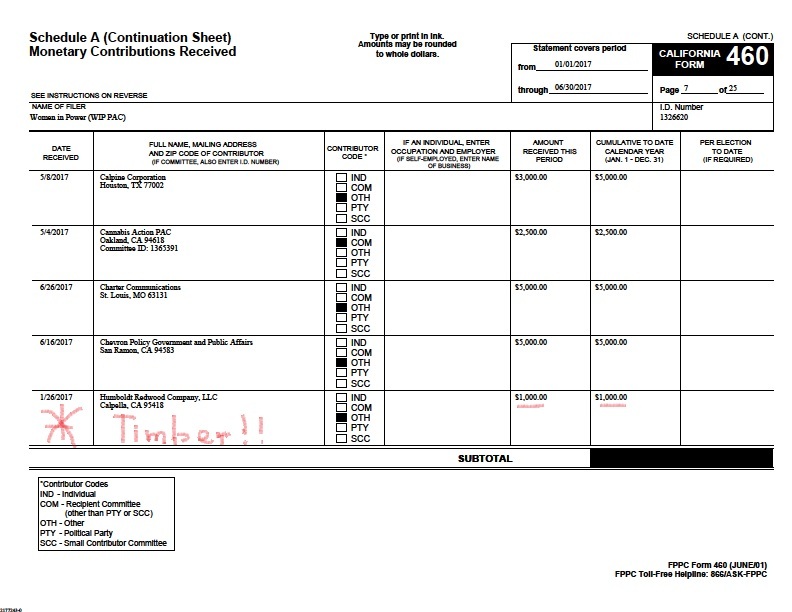 The California Forestry Association contribution to the Wendy Carrillo-supporting "WIP PAC". The women's PAC has contributed $4,400 to Carrillo's campaign - the maximum it can legally contribute (TRUE). The women's PAC has also donated $31,250 (FALSE, its over $60,000 ......, equaling 60% of the contributions) to a PAC supporting Carrillo. This is known as an independent expenditure or IE in Sacramento language. This happens ALL THE TIME. The PAC supporting Carrillo decides how to spend the money (Rusty Hicks concurs, allegedly). TIMBER!! 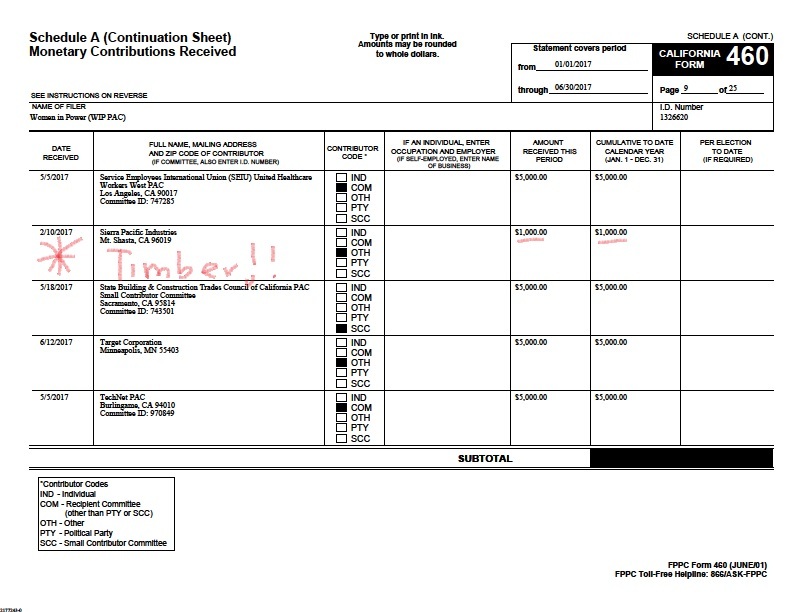 The Humboldt Redwood (harvesting) Company contribution to the Wendy Carrillo-supporting "WIP PAC". This doesn't prove that Carrillo takes money from Chevron. 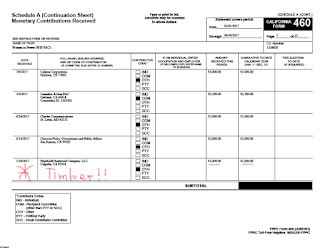 It proves that Carrillo takes money from a PAC whose stated goal is electing more (enabling political) women to the legislature and which solicits money from sources as ideologically diverse as Chevron and the nurses' union (PLUS, money from Big Energy ....., and Big TIMBER). I don't have a dog in this fight; I haven't endorsed, either on behalf of Climate Hawks Vote or personally. I just want to see the fiercest climate hawks (with the backing of Spotted Owl-killing Big TIMBER Corporations?) win every election. And I want Democrats to be honest with each other rather than smear each other (kinda like Billary rigging the Democratic Primary against Comrade Bernie, but I digress). TIMBER!! The Spotted Owl-despising Sierra Pacific Industrie's contribution to the Wendy Carrillo-supporting "WIP PAC". And yes, I'll be speaking w/ whoever runs WIP PAC as to whether it should be taking money from Chevron at all (what about Big Energy ......, TIMBER?) . Hopefully this Clear Cutting, Blogging Deconstruction will help RL Miller view the TRUTH behind Candidate Carrillo's Surrogate's fiscal priming of their "Funding Pipeline of Hypocrisy". Mayor Sam Exclusive: "The Wendy Carrillo Campaign Funding Pipeline of Hypocrisy"
In a Mayor Sam Exclusive, we disclose the "Campaign Contribution Pipeline of Hypocrisy (funded in part by Big Energy Corporations)", that have joined with SEIU in financing a $300,000-plus Independent Expenditure (IE) Committee, supporting 51st Assembly District (AD) Candidate (and noted Dakota Access Pipeline Protester) Wendy Carrillo. 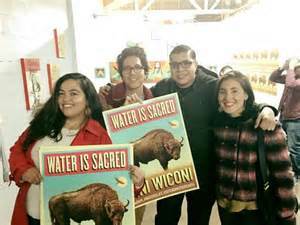 51st AD Candidate Wendy Carrillo (center) with fellow Dakota Access Pipeline/Standing Rock Protesters during her two month sojourn in North Dakota. 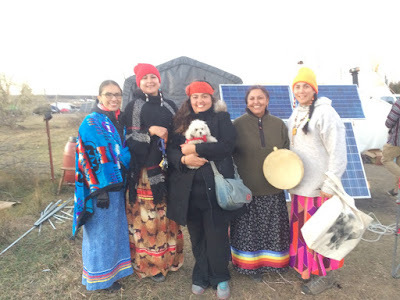 ** Blogger's Notes: In a Mayor Sam Exclusive, we disclose the monetary collusion of SEIU and Big Energy Corporations in financing an Independent Expenditure Committee on the behalf of the 51st AD Campaign of NOTED Dakota Access Pipeline Protester, turned Political Candidate Wendy Carrillo. SEIU surrogates (with connections to LA County Labor Federation Leader Rusty Hicks) recently created "The Working Families for Wendy Carrillo IE", which has been largely funded ($250,000) by the union's 2015 Local ............., and by a certain "Women in Power PAC (as noted in the photo below)". As noted in a CityWatch LA Missive authored by Ruby DeVera (a noted Candidate Luis Lopez endorser), Big Oil Chevron continued its usual giving to IEs supporting candidates with hypocritical proclivities. But upon further review of the financial documents via the "WIP PAC", the INTEGRITY of the Dakota Pipeline Protester, now repeat (within weeks of losing Congressional Race) Candidate for Public Office, will be seriously QUESTIONED, if she does not repudiate the contributions from the likes of PG & E and Sempra Energy, who's "past issues with pipelines", are documented below-----Scott Johnson. 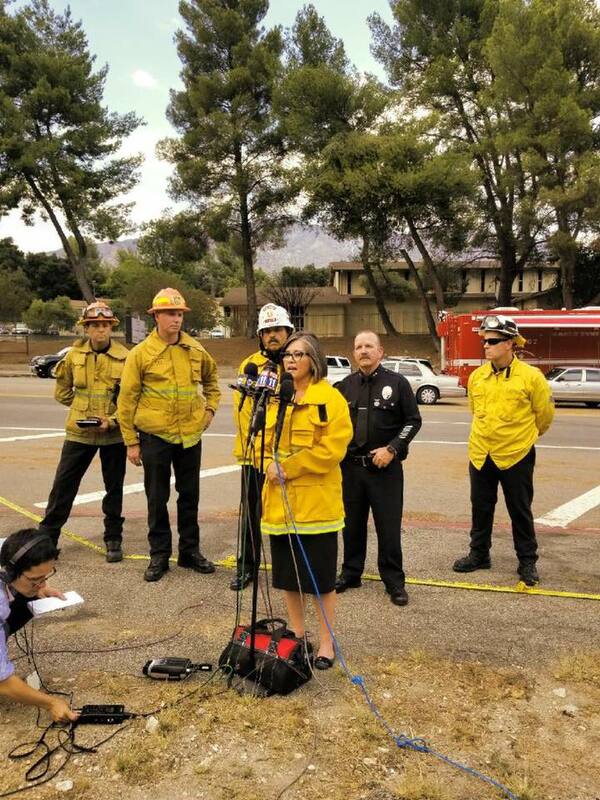 As new CD-7 City Councilperson Monica Rodriguez engaged in "Lights, Cameras, Photo-Ops" during the recent La Tuna Fire, the supposed "Ready, Set, Go Evacuations" of Constituents, along with the ability of First Responders to facilitate them, were imperiled by her supported, Foothill Blvd Road Diet. "Lights Camera, Photo-Ops (with appropriate wardrobe)" for CD-7 City Councilperson Monica "Fire Marshall Lady M-Rod" Rodriguez. ** Blogger's Notes: As new CD-7 City Councilperson Monica "Fire Marshall Lady M-Rod" Rodriguez engaged herself in the "Lights, Cameras, Photo-Ops Duties" of an Elected Official during a civic emergency, as exampled by the recent La Tuna Fire, the daughter of a former LAFD Fireman, apparently FAILED to ensure a speedy, "Ready, Set, Go Evacuation" of her Constituents. 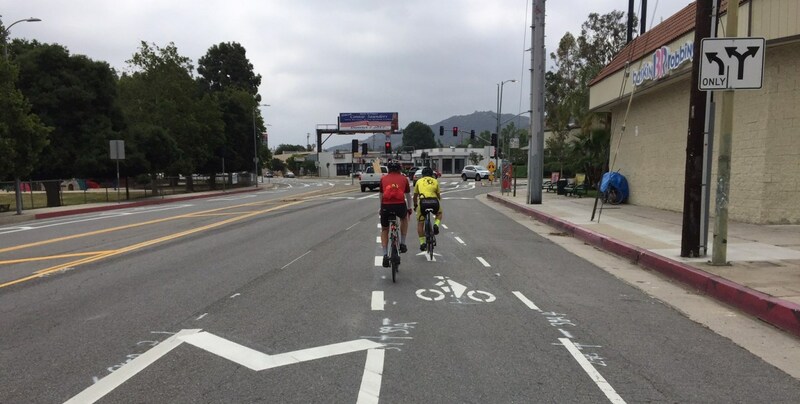 According to a KABC 790 AM Report, Sunland Tujunga Resident's ability to vacate their homes (and First Responder's ability to facilitate), were severely constrained by an imposed Foothill Blvd Road Diet (that constricted Foothill Blvd to one lane in each direction) supported by the Councilperson. 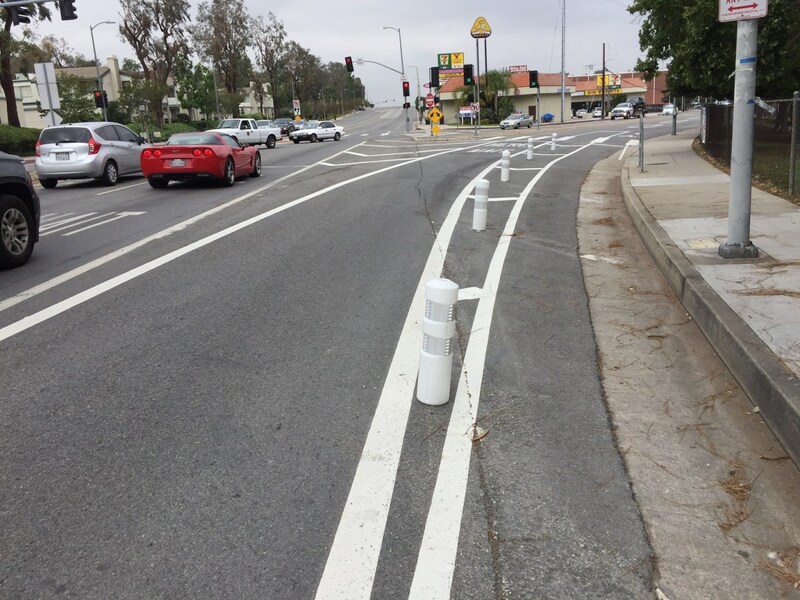 Further, sources tell Mayor Sam that supposed protocols that would of removed the bollards in time of a civic emergency (ie. a major brush fire), were not initiated ..........., despite the FACT that Councilperson Rodriguez was traveling from one location, to the next, in search of "Lights, Cameras, Photo-Ops" opportunities. The STNC wasted no time in voting to ensure NO future, "Ready, Set, Road Diet-inhibiting Evacuation FUBARs", by calling upon their NEW Councilperson to remove the Foothill Blvd Constriction that, NOW CD-7 Statffer Eve Sinclair enabled (on behalf of Rodriguez and Mayor Eric Garcetti) during her time on the STNC Board. It remains unclear whether Councilperson Rodriguez will respect the WISHES of her constituents----Scott Johnson. Mayor Sam Exclusive: Is Councilman Huizar Utilizing Taxpayer-financed Publicity to Build Wife Richelle's Name Recognition ....., for an Upcoming CD-14 Campaign in 2020? In a Mayor Sam Exclusive, we disclose via multiple sources that CD-14 City Councilman Jose Huizar is actively soliciting support for an upcoming "Richelle Huizar Campaign in 2020", to replace him on the City Council when he terms out ........, while using his taxpayers-financed Social Media Accounts to build her name recognition. 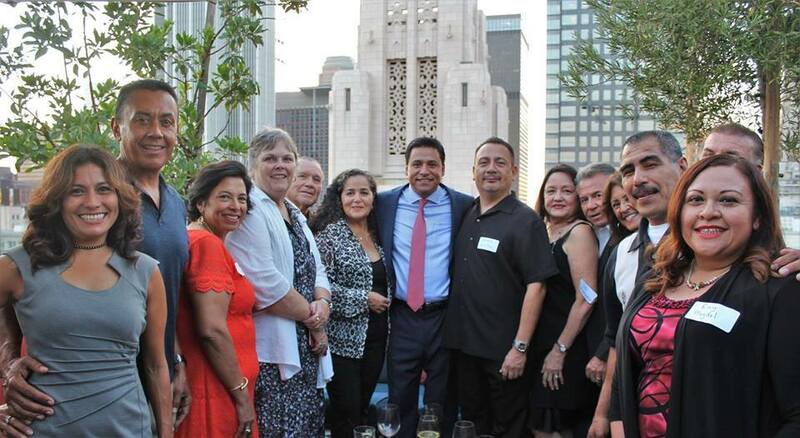 Will the Huizzynistas pictured above during a August 29 Reception at The Perch in Downtown LA, be receptive (and maintain the Loyalty of their Councilman) to an alleged upcoming "Richelle Huizar Campaign", to replace her Princeton Graduate Husband, as the CD-14 Officeholder? 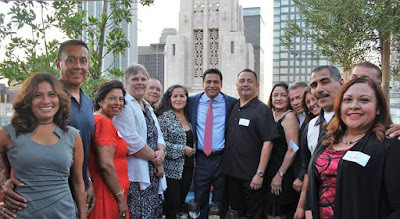 ** Blogger's Notes: As noted in the photo above, taken at the Downtown Los Angeles's Perch Establishment on August 29, there are PERKS in regards to maintaining your LOYALTY and INFLUENCING communal support of the Political Agenda of CD-14 City Councilman Jose Huizar. Some of the supposed community leaders (more like self-serving enablers) pictured above, have been bloggin subjects in the past (for dubious reasons), but what ALLEGEDLY was the motivation for Councilman Huizar's gathering of Loyaltists at a pricey location, may have been a TEST of true allegiance to an aspiring "CD-14 Family Political Dynasty". According to multiple sources, the Birthday-celebrating, "Dear Charro, Princeton Graduate", used The Perch Gathering of Loyalists, to promote his (and Richelle's?) desires that they support his alleged Wife Richelle's 2020 Campaign to replace the termed-out Officeholder in City Hall. The speculation of a possible "2020 RICHELLARY CAMPAIGN " are reinforce via a NOTABLE increase of joint Jose and Richellary Postings on the Taxpayer-Financed Official Twitter and Facebook Account of the current CD-14 Officeholder (as exampled below). 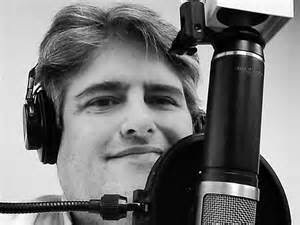 With the supposed next CD-14 City Council Election three-plus years away, if a rumored "Richellary Campaign" becomes reality, then the public cost of branding the Heir to a Family Political Dynasty ........, is already an ethical concern-----Scott Johnson.